If you have concerns about the environment and environmental sensitivities, then you’re not alone. More and more people in Centerville are making choices in products and services with the environment in mind. If this sounds like you, then you’ve come to the right place! Dry Advantage Organic Carpet Cleaning is proud to offer green carpet cleaning services to all of our Centerville customers. Our process solves the two biggest complaints in the carpet cleaning industry! No wet moldy carpets and no returning stains. Not to mention the thousands of gallons of contaminate waste water our competitors waste every year. We are the leaders in a better, safer and healthier way to get your homes valuable carpets clean. Our process is recommended by over 150 carpet manufacturers and over 100 fiber manufacturers as well as most padding manufacturers. Our all-inclusive service comes with no upcharges, no add-ons and no surprises. 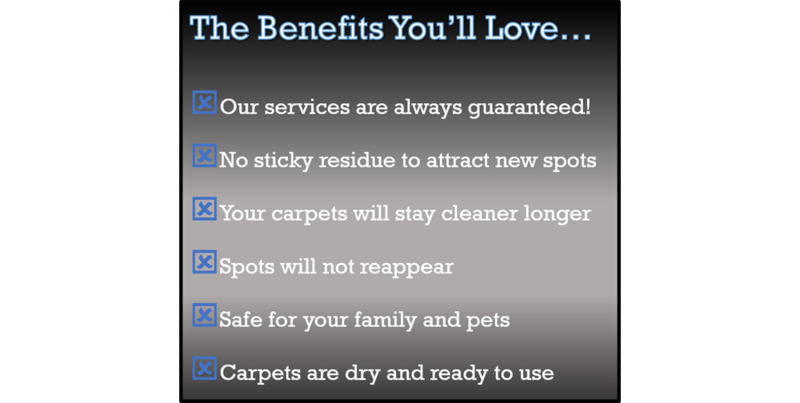 We specialize in the new way to clean carpets! Dry Carpet Cleaning means NO WET CARPETS! Your carpets will be clean, dry and ready to use immediately after cleaning. So if you live in Dayton or the surrounding area, and you are looking for a carpet cleaning service that guarantees a 100% clean, dry, beautiful carpet cleaning job, just give us a call. You’ll love it… and that’s our promise!